Every website owner wants to know the best way to grow their website’s traffic. But here’s the thing–every website is different. Not all of the differences matter, but one difference makes a huge impact. That’s the lifecycle stage your website is in. Depending on the stage, your goals, strategy, and steps to grow are different. At each stage, a website is capable of different things. Based on what the site is capable of achieving, you need to focus on doing what it takes to grow until you’re ready to move on to the next stage of development. In Stage 1, the site is brand new. It’s focus is having enough interesting content that visitors will follow the site and join your email list so they get more great content. If there’s not enough there to make a site worth following, why invest in driving traffic to it? You do that by creating enough insanely great content that most of your visitors find themselves reading more than one article. You test your results by looking at two things. First, you should be getting good analytics–time on site is high, pages visited is high, and bounce rate is low. The Top 15 are getting not quite 2 minutes of average visit duration, almost 2 pages seen, and a bounce rate of 63.03%. That’s right–the average small blogger does better than the Top 15. All we’re looking for here is to have you get to their averages. Let me explain what I mean by Borrowed Traffic. If you’ve got traffic on your site because people typed in the URL, bookmarked it, or searched for it, that’s not borrowed. OTOH, if you’ve got traffic because people followed a link on Facebook, Twitter, a Blog Comment, an Ad, or anything similar, you’re borrowing traffic from another site. They came to that site for some reason, consumed some content, encountered a link to your site, and clicked through. As you can see, Search Traffic is the source for the overwhelming majority of these marketer’s traffic—almost 44%. Direct is the only thing even close, and it reflects a lot of search traffic as well as brand recognition for these well-known marketers. 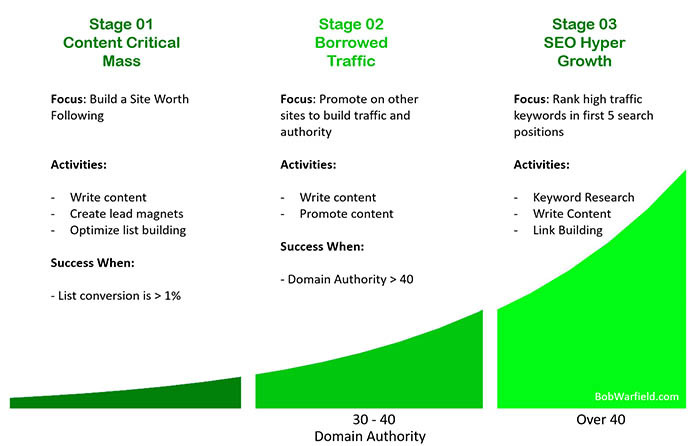 The problem is, in Stage 2, your site doesn’t have enough authority to dominate high volume keywords. You just can’t rely on Search for the majority of your traffic. 1.85x more likely to get Referral traffic. That’s links on other sites back to their site. 4.29x more likely to get traffic from Social Media. 7.76x more likely to get traffic from advertising. In other words, they are borrowing traffic from other high traffic sites. To do so, they need to write content that is interesting to those other audiences and then promote that content on the other sites. Here’s an important nuance—you have to test as many sources of borrowed traffic as you can. I tested 11 in the first 8 weeks after I started this blog. Facebook: An old standby and not bad, but it only brought half the traffic Quora did despite my actually spending a lot more time on it. LinkedIn: This is the #2 for my CNCCookbook site, but only brought 1/8 the traffic of Quora for my entrepreneur’s site. CNCCookbook has a large B2B audience, and I suspect that’s why it does so well with LinkedIn. Pinterest: This is #1 for CNCCookbook, which makes little sense. It’s audience is dominated by women, mine is men. It’s not a B2B venue at all, but CNCCookbook is 70% B2B. Nevertheless, I get great traffic from it on CNCCookbook. I think the reason is the scarcity of photos for my topic areas so anyone who is interested comes to me quickly. I got almost nothing for the entrepreneur blog. I will try again in 6 months. Medium: Have heard great things about it, but I only got results about 1/8 as good as Quora for the entrepreneur blog despite a fair amount of work. Could be I just haven’t found the formula yet. Reddit: Again, I’ve heard great things. Results were not bad—a little better than LinkedIn, but nowhere close to Quora. Blog Comments: Leaving blog comments is a time-honored tradition that was my main method of building CNCCookbook when I first started. It can help a lot, but I find it very time consuming relative to the other methods. I did get decent results commenting on some of Neil Patel’s posts, but again, nowhere close to Quora. Guest Posting: This has been my #2 for the entrepreneur blog. Very effective if you can find some good opportunities and great for link building too. 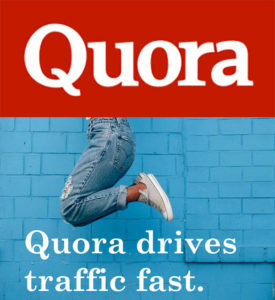 Still, for raw traffic Quora wins hands down. Google+: Not bad, easy to do, but not huge either. Mostly, I like it because it shows up often in search results where I otherwise couldn’t play. YouTube: Pretty decent channel, but it is a lot of work to produce videos all the time! Repurposing Content: This is basically rewriting content to different formats. For example, converting a blog post to a video or slideshow. Again, decent results, but a lot of work. Quora: In aggregate, I got about 1500 visits during the 8 weeks from Quora. This was my single largest traffic driver by 2x, and I will be doubling down on it and discontinuing most of the others moving forward. Note how the results vary between my two websites. Quora was awesome for BobWarfield.com, but completely ineffective for CNCCookbook. Pinterest was just the opposite—great for CNCCookbook but did nothing for BobWarfield.com. Your job is to find the best water coolers (online sites) where you audience likes to hang out. Every 6 months to a year, retest platforms that didn’t work after researching ways to improve your success on those platforms. Want to understand all that in more detail? You can apply my detailed step-by-step strategy in that article to Quora or most other platforms. #1 – You’ll get significant traffic from these platforms. My new blog went from 200′ish visitors in the first week to over 3000 by the 8th week. 91% of that traffic was from these kinds of sourcs. #2 – If your content is really good and you make it easy, people will share it on social media and they will link to it. By my 8th week, I had about 1600 backlinks from 24 referring sites, and my domain authority had risen from a low of 24 to 29. Now the critical indicator for when you’re ready to move to the next phase is your domain authority. Our Top 15 Master Marketers get so much from SEO traffic, it’s like traffic just falls from the sky onto their sites. Unfortunately, we can’t get there until we have enough domain authority to win high search ranking for valuable keywords that drive big traffic volumes. This is a soft number, but I view anything less than 30 as being too weak to generate much SEO traffic at all, and you can’t start to really dominate enough interesting keywords until you hit a 40′ish domain authority. With low domain authority, you can win some keywords, but they’re likely to be low traffic long tail keywords. Nothing wrong with that—they can still add up and they are often much higher converting. But you have to capture a lot of long tail keywords to get the kind of traffic a single high volume “whale” keyword can bring. BTW, those numbers are via Ahrefs.com, a very valuable service! So, you need to hang out at this stage, cranking out content that helps people on other sites and referring them to your content. 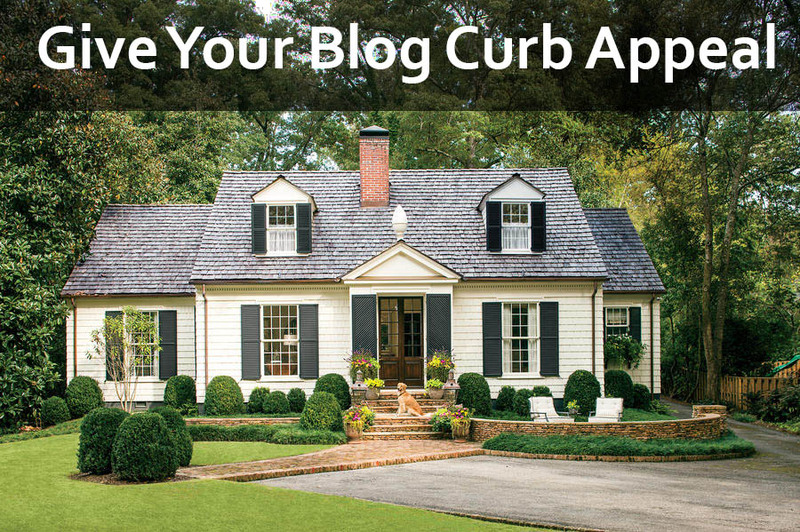 It’s the online equivalent of going door to door until you’ve built your brand enough they will come looking for you. At that point, you’re ready for the next stage. At this stage, it isn’t that you’re given up on the other growth drivers such as promotion on other platforms, it’s just that you’re ready to take your rightful place drinking in the high octane traffic that is search engine traffic. Those Top 15 Master Marketers get the majority of their traffic from SEO for one reason—it is the highest leverage + lowest cost way to get traffic that there is. Period. You are making bank when you are ready to go with SEO, because it is a mega horsepower growth engine! Sorry, I’m a car guy. I salivate over images like that camaro with the blower! There are zillions of keywords out there to go after. Each one has a difficulty score based on who else is competing for the keyword. It’s based on the domain authority of the competitors. Think of your domain authority as your weight class for boxing. The higher it is, the more fights you can win, and the bigger the stakes for those fights. Keyword research to find which fights you can win. Writing content that wins for those keywords. Building backlinks so your domain authority goes up and it gets easier to win. You now have a complete roadmap for how to increase your website’s visitors. At least at a high level. BTW, it’s usually not going to be a good idea to try to monetize your web site until hit that third SEO hypergrowth stage. You just aren’t getting enough traffic and you don’t want to add any friction (like advertising) that discourages your visits. Stay focused on building your traffic until you get there. Plenty of time to monetize later. This strategy and the lifecycle idea are core concepts from my upcoming course for Entrepreneurs–Customer Critical Mass. In the course, I will take you all the way from coming up with the right idea for an online business, creating the website, and growing your traffic until you’re ready for SEO Hypergrowth. The course will be very complete with step-by-step blueprints that I’ve used to build my CNCCookbook site and several other companies to huge traffic. If you are interested in hearing more about the course, and if you want to keep getting articles like this one, sign up for my newsletter below. I’ll even give you a taste of what my teaching style is like. When you sign up, you get access to my free productivity hacking course, Work Smarter and Get Things Done. Work Smarter teaches you all of the productivity hacks I’ve collected over the years and even includes free software to help you get the most from them. Some of these hacks are borrowed and some I developed myself. I helped create the productivity systems used by the world’s greatest software companies, but you can benefit from them in almost any pursuit.